2 OWNER JEEP WITH CLEAN CARFAX. 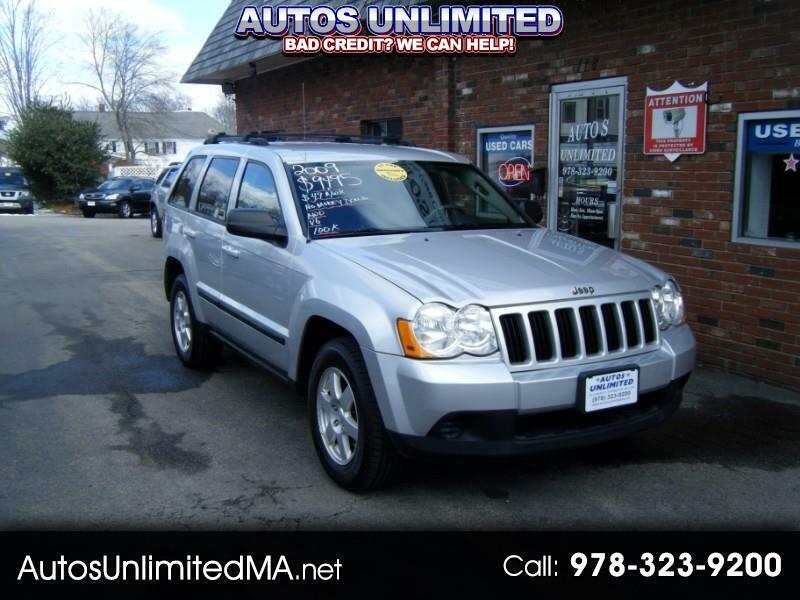 2009 JEEP GRAND CHEROKEE LAREDO. 3.7L V6, AUTOMATIC WITH ALL WHEEL DRIVE. FULL POWER OPTIONS, FACTORY ALARM/KEYLESS ENTRY, AM/FM CD WITH AUX, MP3 AND SATELLITE, COLD AIR, CRUISE CONTROL, FACTORY TINT, 17'' ALLOY WHEELS, NEWER KELLY TIRES AND MORE. VERY CLEAN INSIDE AND OUT. 90 DAY/3000 MILE WARRANTY INCLUDED. ALL FOR $9495. EASY FINANCING AVAILABLE$0 DOWN AND $49 PER WEEK. FOR MORE PICTURES, INFO AND TO GET APPROVED TODAY PLEASE VISIT AUTOSUNLIMITEDMA.NET OR CALL AUTOS UNLIMITED 978-323-9200. IF YOU PREFER TEXTING PLEASE TEXT 978-726-4107. THANK YOU. Dealer is not responsible for any data errors and/or omissions that may be displayed on site. Please contact dealer for details.